- no defenders touch the baseline if coach passes to 1 or 2. 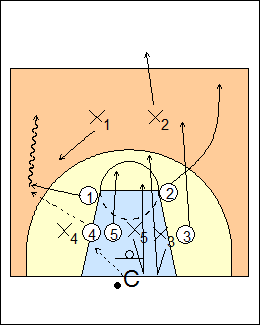 If team O scores at the other basket (or gets fouled), they get a point and first pass from a coach at the other end, if team X gets a stop they counter-attack, play to a score, referee whistle or ball out of bounds, the team with possession sets up for a pass from coach on their baseline. Play to about 6 baskets, award foul shots only when they could win the game. 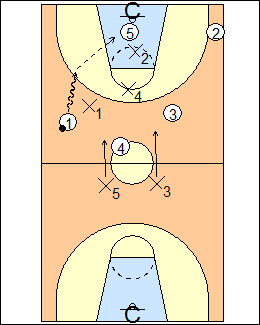 See Transition - 4 on 4 recover, for other Dean Smith scrimmage ideas see Scrimmage - 5 on 5 halfcourt stops, Stop and break, Pressing - 444, Tennessee 55 reaction, Defence - Tar Heels scramble.